Alliance Boots shareholders have approved an £11.1bn buyout by private equity firm KKR and deputy chairman Stefano Pessina. 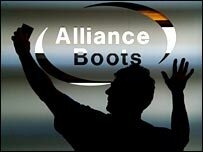 A total of 96% of Alliance Boots shareholders backed the deal. It is the first time a FTSE 100 company firm has been bought by a private equity firm. The firm expects the takeover to be complete in July, although it remains in talks with pension trustees over future pensions provision. KKR first approached the Boots board in March with an offer for the firm. A bidding war briefly broke out when an investment consortium led by Guy Hands and Terra Firma made an offer for the pharmacy chain, but KKR increased their offer by £500m, which forced their rivals out of the race. Earlier on Thursday, the head of the Alliance Boots pensions fund attacked the firm for backing the deal before an agreement had been reached on future pensions provision. John Watson, chairman of the trustees of the health and beauty group's pension scheme, made the comments ahead of the shareholder vote on the takeover. He is worried that the debt being taken on by buyer Kohlberg Kravis Roberts (KKR) may jeopardise the scheme. Alliance Boots said it was urging KKR "to come to some arrangement". "The fact of the matter is that the Boots' pension fund is one of the best run and best funded schemes in the FTSE 100 index," said Alliance Boots chairman Sir Nigel Rudd. "You have my assurance that I will be pressing very hard for an agreement." The pensions scheme's trustees have already intimated that a current review of the fund may show a £305m deficit. They are pushing for KKR to put up to £1bn extra into the scheme. While the trustees have no power to veto the Boots takeover, if an agreement with them is not made it will be the first time that a FTSE 100 company has changed hands without the approval of its pension fund trustees. "We have made it clear that the borrowings taken on to finance the acquisition will affect the scheme," said Mr Watson. The Alliance Boots pension fund has 66,000 members, including 16,000 employees who are still making contributions.